This imposing portrait of Major John Caulfeild, Commander-in-chief of the British forces on the Island of Roatan, was painted after the sitter returned to England in 1743, and when the artist George Knapton was particularly busy with military and naval commissions for commemorative portraits following the numerous British campaigns against France and Spain, including the War of the Austrian Succession (1740 – 1748), King George's War in North America, and the disputes against Spain in the Americas over colonies and trade since 1739. It also appears the sitter and the artist were particularly well acquainted, both living on Gerard Street in London. Indeed, Knapton was a witness to John Caulfeild’s will, dated 1752. By direct descent within the Caulfeild family, until 2016. A. Cormack, “Communication: John Caulfeild, Governor and Commander-in-Chief of Rattan” from Journal of the Society of Army Historical Research, Vol. 95, no. 383 (Autumn 2017), pp. 197 – 206, illus. p.196. The archives at Belize record a Major Caulfeild in command of Rattan (Roatán) as early as 1745. On 2 August that year, the Major wrote a letter to a Mr. Trelawry, Govenor of Jamaica, describing Spanish harassment of English settlements (Archives, vol. I: 15). These settlements appear to have been well established on the island of Roatán by 1775. A map of that year, drawn by Thomas Jefferys, Geographer to His Majesty, clearly shows essentially all of the present older settlements, bearing their current names, with the exception of Calkett's Hole (now Coxen's Hole) and Falmouth Harbout (now Oak Ridge). The British seized control of the Honduran island Roatan in 1742 – the year before the present portrait was painted – following an appeal from the indigenous people stressed from the increasing pressures by the Spanish. Located within the bay of Honduras, Roatan’s appeal lay in its strategic positioning within close reach of the central and southern Americas. On capturing the island, Major Caulfeild was selected by a Council of War, along with 50 British Marines and 200 Americans, to place the island in a state of defence from the Spanish, arriving on 23 August 1742. Interestingly, the American enclave, apparently frustrated by the British orders, attempted a mutiny on their arrival to apparently render the new settlement an American colony. Luckily the Marines were prepared and managed to efficiently subsume the mutineers in time before any risk was realised. In 1747, on sensing another rouse by the Spanish, Major Caulfeild, with the help of William Pitt, sent an envoy to assess the threat brewing in the Black River in nearby Guatemala. On confirming their doubts, Caulfeild sent a plea for help to the Governor of Jamaica. Despite reinforcements it seems that the British evacuated the island on 30 November 1749, and their fortifications and quarters were demolised. John Caulfeild descended from a noble Anglo-Irish family of army officers and politicians who retained some 26,000 acres in Armagh and Tyrone, including their estates at Castle Caulfeild and Charlemont. His parents were William Caulfeild (1625 – 1671), 5th Baron Charlemont, later 1st Viscount Charlemont, and the Hon. Sarah Moore (d. 1672). Caulfeild married Sydney Somerville (d.1725) and had three daughters, Mary, Alice and Elizabeth all of whom pre-deceased their father. Thus his estates and considerable sums of money were bequeathed to his brothers William and Toby. 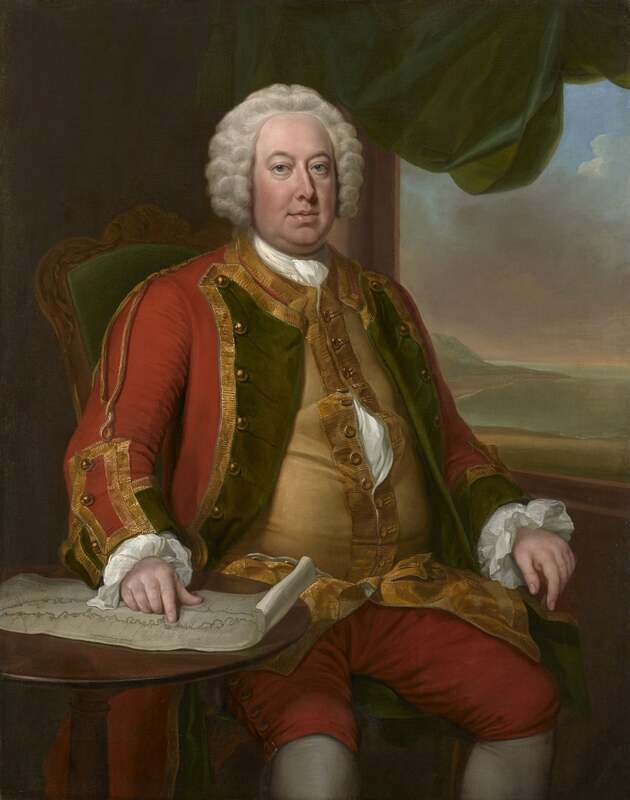 George Knapton was apprenticed to Jonathan Richardson Snr. for five years after which he travelled to Italy from 1725 to 1732, before returning to England to work as a portraitist, primarily in pastel but also in oils.Between 1741 and 1749 he made a series of twenty-three portraits in oil of the members of the Society of Dilettanti, of which he himself was a member.In 1750 he worked with George Vertue on a survey of the paintings in the Royal Collection and this introduction to the Royal palaces appears to have been responsible for one of his most important commissions, the large-scale group portrait of ‘The Family of Frederick, Prince of Wales’ signed and dated 1751, Royal Collection, Windsor Castle) and for his appointment as Surveyor of the King’s Pictures in 1765.